Celebrated today in Italy and in many other countries is the Solemnity of the Lord’s Ascension. This feast contains two elements. On one hand, it directs our look to Heaven, where Jesus, glorified, is seated at the right hand of God (Cf. Mark 16:19). On the other, it recalls the beginning of the Church’s mission: why? Because Jesus risen and ascended into Heaven sends His disciples to spread the Gospel throughout the world; therefore, the Ascension exhorts us to raise our gaze to Heaven, to then turn it back immediately to earth, carrying out the tasks that the Risen Lord has entrusted to us. It’s what today’s Gospel passage invites us to do, in which the event of the Ascension comes immediately after the mission that Jesus entrusts to the disciples. It’s a boundless mission, namely, literally without boundaries, which surpasses human strength. In fact, Jesus says: “Go into all the world and preach the Gospel to the whole creation” (Mark 16:15. The task that Jesus entrusts, to a small group of simple men without great intellectual capacities, seems truly daring. Yet this meager company, irrelevant in face of the world’s great powers, is sent to bring Jesus’ message of love and mercy to all corners of the earth. However, this plan of God can only be realized with the strength that God Himself grants to the Apostles. In this connection, Jesus assures them that the Holy Spirit will sustain their mission. He says thus: ”You shall receive power when the Holy Spirit has come upon you; and you shall by my witnesses in Jerusalem and in all Judea and Samaria and to the ends of the earth” (Acts 1:8). So this mission was realized, and the Apostles began this work, which was then continued by their successors. The mission entrusted by Jesus to the Apostles has been carried out through the centuries, and it continues still today: it requires the collaboration of us all. Each one, in fact, by dint of the Baptism he received, is qualified on his part to proclaim the Gospel. It’s in fact Baptism that qualifies us and also drives us to be missionaries, to proclaim the Gospel. While the Lord’s Ascension into Heaven inaugurates a new way of Jesus’ presence in our midst, it asks us to have eyes and a heart to encounter Him, to serve Him, and to witness Him to others. It’s about being men and women of the Ascension, namely, seekers of Christ along the roads of our time, bringing His word of salvation to the ends of the earth. In this itinerary, we encounter Christ Himself in our brothers, especially in the poorest, in those that suffer in their flesh the harsh and mortifying experience of old and new poverties. 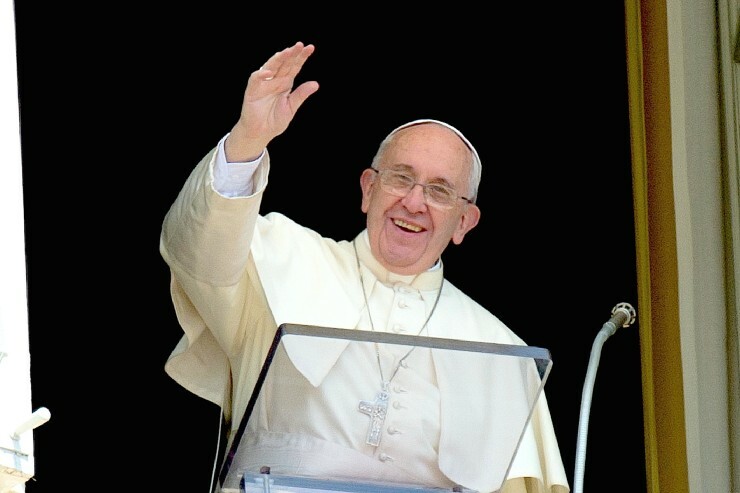 As at the beginning the Risen Christ sent His Apostles with the strength of the Holy Spirit, so today He sends all of us, with the same strength, to put concrete and visible signs of hope; because Jesus gives us hope; He has gone to Heaven and has opened the doors of Heaven and the hope that we will arrive there. May the Virgin Mary that, as Mother of the dead and risen Lord, animated the faith of the first community of disciples, help us also to keep “our heart high,” as the Liturgy exhorts us to do. And, at the same time, may she help us to have our “feet on earth,” and to sow the Gospel courageously in concrete situations of life and history. I’m particularly close to the dear people of Indonesia, especially to the Christian communities of the city of Surabaya, harshly stricken by the grave attack against places of worship. I elevate my prayer for the victims and their kin. We invoke together the God of peace so that He will make these violent actions cease and in the heart of all room be found for sentiments — not of hatred and violence — but of reconciliation and fraternity. We pray in silence. Observed today is the World Day of Social Communications, on the theme “Fake News and Journalism of Peace.” I greet all the media agents, in particular, the journalists who are committed to seeking the truth of the news, contributing to a just and peaceful society. I greet all of you, Romans and pilgrims, in particular the musicians and folkloric groups from Germany; the Paraguayan residents in Rome of the “Virgin of Caacupe “ community; the participants in the UCIIM congress, 50 years after the death of the Founder, Gesualdo Nosengo <and> the “Dives in Misericordia” Movement of Naples. I greet the faithful of Catania, Scandicci, San Ferdinando of Puglia and San Marzano Sul Sarno; the numerous young Confirmation candidates and Confirmed youngsters of Genoa, as well as those of Emmenbrucke (Switzerland) and Liscate; the children of the Saint Justin parish of Rome; and the students of the “Tommaso Aversa” Institute of Mistretta. I greet the dependents of the “Federal Express Europe,” with the hope that the present difficulties find a positive solution. A special thought goes to the Alpine troops, gathered in Trento for the National Parade. I encourage them to be witnesses of charity and agents of peace, on the example of Alpine Teresio Olivelli, defender of the weak recently proclaimed Blessed. And today, being the day dedicated to mothers in many countries, an applause for the mothers! I want to greet all mothers, thanking them for their custody of the family. Y remember also the mothers that look at us from Heaven and continue to protect us with their prayer. Let us pray to our heavenly Mother that today, May 13, with the name Our Lady of Fatima, she may help us to continue on the way.